In order to provide outstanding final products, it is essential the materials we develop fully utilize the inherent properties of their ingredients, and so it is extremely vital that they must be tested to ensure safety at each corresponding developmental stage. 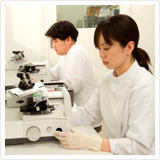 We regard safety assurance as a vital role in our development research activities, and equipped with enhanced testing facilities we conduct highly reliable safety tests that comply with standards and regulations stipulated by the government of Japan, thereby ensuring the highest level of safety measures. 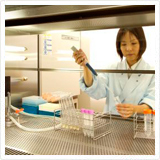 Safety testing and evaluation for Probiotic microorganisms. 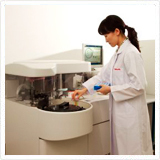 Safety testing and evaluation for developed food, pharmaceutical and cosmetics products and their materials. Copyright © Yakult Honsha Co.,Ltd All Rights Reserved. Produced by Yakult Honsha Co.,Ltd.